Forklift Mounted Drum Dumpers Archives - Liftomatic™ Material Handling Inc. The proper equipment makes drum dispensing and dumping easier and safer. This is true across a wide range of applications, but how do you find the right drum handler and dispenser? Here are some things to know. Drum handling equipment includes drum lifters and dispensers. They are beneficial in various industries, with different designs being suitable for different industrial and commercial applications. From food processing to ball bearings, small parts, pharmaceuticals, paint, and coatings, there are many uses. Given the diversity of work environments, it is important to use the right drum handling equipment for the situation at hand, whether it be dispensing or mixing contents from or in drums. There are many variables for drum dispensing, such as ergonomics, space utilization, and throughput. Consider the type of material you’ll be working with (liquid or solid?). Also consider any special requirements for the material – is it flammable or explosive? Could it corrode certain types of metal? How much room is there around the warehouse for drum handling equipment? Will people be required to operate the equipment by hand, or do you have an automated process? This is why we craft custom handling equipment for drums and barrels to meet each of our client’s needs. Liftomatic Material Handling has product modifications to suit different dumping capabilities. We recognize that no two clients are identical and this is true of drum dumping applications; thus, we customize our handling solutions to each customer. The newest addition to our product line is the Tip-Mate™ 800 drum dumper, which features a push-button activated clamping system to dump 55-gallon drums weighing up to 800 pounds using a forklift truck. Unlike many other dumpers, the Tip-Mate™ 800 does not require foot pumps, hand cranks, or any other manual activity to activate it, other than pressing the button, which makes for an easier process. 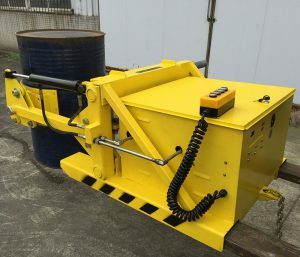 Other types of drum dumping equipment we manufacture include Below Hook Drum Dumpers, which are meant for steel, plastic, and fiber drums weighing up to 1,000 pounds each, Forklift Mounted Drum Dumpers, and portable models. Our experts are happy to help you determine which one is best for your organization’s needs. Do you want to learn more about specific drum dumping applications? Call us at 1-800-837-6540, so we can review your material handling needs. We specialize in building material handling equipment, specifically for drums and barrels.